A Canadian woman who went missing during a blizzard last week has been found alive, buried in 23in (58cm) of snow, police say. 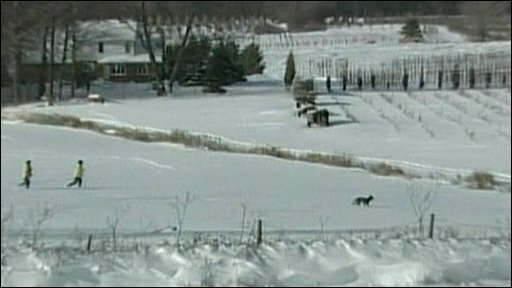 Rescuers were shocked to find Donna Molnar, of Ancaster, west of Toronto, still conscious after she spent three days outside in freezing temperatures. Ms Molnar, 55, vanished on Friday after her car became stuck in a snowy field, and is now being treated in hospital. Police dog Ace and his handler Ray Lau have been credited with the find. "When I came up to her she was covered in snow, just her face and her neckline were exposed," rescuer Ray Lau said. "I was surprised she was alive." Mr Lau found Ms Molnar on Monday, just a few hundred yards away from her four wheel drive car, wearing little more than a winter jacket and suffering from hypothermia. Police credited the insulating effect of the snow with keeping her alive. Staff Sgt Mark Cox said she was suffering from frostbite and could lose some of her extremities, although she was expected to survive. "That's the miracle. That's a Christmas miracle. Sometimes the good don't die young," said Mark Mackesy, a family friend who spent the weekend comforting Ms Molnar's husband and son. "Donna Molnar is an exceptional person," he added. Canada and much of the US have been hit by extreme winter weather in recent days, with vast amounts of snow falling from coast to coast. Transport has been disrupted and thousands of homes have been left without power.